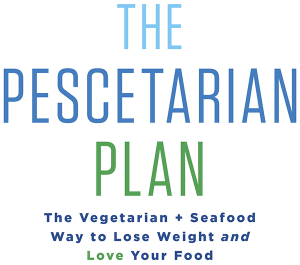 The Pescetarian Plan: Slimming and Wildly Healthy! • Slims you down. Pescetarians are, on average, about 20 pounds lighter than regular eaters. • Fills you up. It’s amazing how much food you get when you take red meat and fried foods off your plate. Easy-to-follow portion instruction (not calorie counting) is key to this plan. • Offers the benefits of a Mediterranean diet. A wealth of scientific research confirms that the Mediterranean diet is the healthiest eating style on the planet. It just got healthier by eliminating red meat and poultry! • Fights inflammation. High levels of omega-3 fats in fish and phytonutrients in plant foods fight chronic inflammation, which plays a role in heart disease, diabetes, cancer and dementia. • Is easy, easy, easy. This program is a cinch to follow, whether you’re at your desk, in a plane, at a restaurant, in another country, or in your own kitchen. • Is delicious. Jibrin teamed up with Chef Sidra Forman, whose seriously tasty recipes average only eight ingredients (including salt and pepper). Most dishes take just five to 25 minutes to make. • Lasts a lifetime. Being a pescetarian isn’t a “diet” that you go on and off—it’s an ultra-nutritious eating style with endless variations. 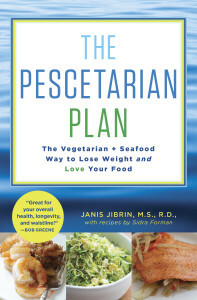 There is no healthier or more delicious way of eating than pescetarian, and with Janis Jibrin’s nutrition expertise, and Sidra Forman’s cooking know-how, it has never been easier.